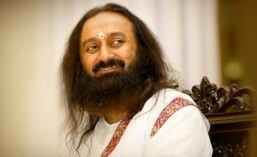 Q: Guruji, sometimes, dealing with kids gets so tricky that I tend to lose my patience. Everyday I decide to be calm, but when the situation arises I am not able to control myself. What should I do? Sri Sri Ravi Shankar: You can’t do anything about it now, you have to live life spontaneously. Do you see what I am saying? It is okay to sometimes lose your temper, never mind. You should leave a little room for imperfection in life, and start accepting. So this is the direction in which we go. Sometimes you slip here and there, never mind, keep moving. Definitely one day, you will achieve perfection. The other day, one teacher who has been in The Art of Living for around 20 years said to me, ‘Guruji, sometimes it feels so strange that I am happy all the time. Come what may I am happy’. 20 years is not too much time, it is okay. But you don’t need to take 20 years. Turn back and see the growth in you; this is why these celebrations are done. What is the purpose of Guru Purnima? Once in a year, you turn back and see where you were and how much you have progressed. How you respond differently to situations now and how your reactions have reduced and responses have increased. So, life is a continuous process. Isn’t it so? If someone says that you should salute them because they are born enlightened. Some kids are there to teach you a lot of lessons. And it is okay for mothers and fathers to sometimes get upset with their kids. You don’t have to bring them up with all rosy, rosy, nicey, nicey and sweet words all the time. Then you will make them very weak. I have seen parents who have never scolded their children. These children when they grow old, they can’t stand any criticism. A little criticism, a little disrespect from someone or a little bit of failure rattles them. They become so upset because they never experienced anything like that at home. So at home, being upset with kids sometimes (not all the time), is like giving them a vaccination so they get stronger to the world outside home. But don’t take this as an excuse to all the time get upset with the kids, it does not work. Too much of it is also bad. If you are scolding your children every day on a routine basis, they become so thick skinned and they go all the way to the other side, which is also not good. A little dose here and there is okay. Q: How much importance should one give to astrology, particularly when choosing a partner? Sri Sri Ravi Shankar: It is good; you can compare the charts to see how much you naturally match with each other and how much you have to compromise. compromise.’ So these calculations are there. It is good to know this, so if one of you gets upset you get reminded that you need compromise a little more; yes! Of course, planets do have an influence, but don’t think it is one way. You too have an influence on the planets. It is two ways. In the universe it is all two ways. So what you can do? You can do chanting. That is why it is said, ‘Om Namah Shivaya’ is a chant which controls all the planets. On top of all the planets is the Shiva principle. So correction is available there. The correction is Om Namah Shivaya because this chant has all the elements which can nullify any bad effect. Do you know the reason why there is the number 108? How many of you don’t know what 108 signifies? 108 signifies the nine planets and 12 houses, the constellations. When nine planets move through 12 constellations, they make 108 different changes. So to nullify those changes or any unpleasant effect, we say Om Namah Shivaya. So it is like a shield. It is considered a very auspicious mantra. Even the steps to this hall are 108 steps from the bottom. That means you transcend all planetary effects and rise to pure consciousness. Sadhana, pranayama, meditation, satsang, chanting, singing, what is the point of doing all this if everything is being ruled by the planet? No, these are like the checks and balances. They will counter the effects and bring more independence; otherwise our consciousness is dependent on time and space. Also, sadhana brings freedom, to a great extent. I won’t say 100%, but yes, to a great extent. It is like, when it is raining and you go out, you have a choice, either you go out and get drenched, or take a rain coat and not get drenched. Q: If you are not sure of a decision, for example, getting married, should you just go with the flow and get married or wait until you are certain? Sri Sri Ravi Shankar: You should ask your partner with whom you want to get married. There are some who are fickle minded, who need a push to do anything, including marriage. And there are others who face such situations once in a while. So I leave the choice to you. And there are yet others, who would like to marry every time they see a beautiful girl or boy, and the moment it starts becoming a little more concrete, they have doubts whether they should or they should not, or if somebody else may be better. Again, here I would say, take the opinion of your partner, whether they want to get married to you, to such a fickle minded person. Do you know what my usual answer for all these questions are? Choice is yours, blessing is mine!